I know, I know: half the reason many ardent campers seek the company of the woods is to leave behind their job, life's daily pressures, and the incessant nagging of technology. Love your smartphone or not, you too have probably had at least a moment where you were about ready to chuck it out the window. All the same, you may be getting some iTunes or Google Play gift cards for the holidays, and Ardent Camper has some suggestions for your digital shopping spree! There are some wonderful apps in both stores for iPhone and Android users who love to spend time outside. And if you're wondering how to use your phone in the backwoods, consider a BioLite CampStove or another gadget that charges your electronics (see Ardent Camper's review) along with a satellite phone plan. AllTrails allows you to determine which hiking and biking paths are nearby, what activities they offer, and how long and difficult they are. Its active community leaves helpful reviews, and it's easy to add your own, complete with photos. Best of all, it allows for trailhead check in and provides zoomable trail maps for you to follow every step of the way. This fantastic app finds camping sites by your current location or a location you specify and gives plenty of details on each, from phone number, photographs, reviews, pricing and more. You'll find full lists of amenities and a chance to add your own thoughts on the places you stay. Use this app to make sure you lay down your head in a campsite perfect for you every night of your journey. Some wonderful (and cheaper) alternatives include Camp Finder ($2.99, available for iPhone and Android) and The Ultimate US Public Campground Project ($5.99, available for iPhone). Especially if you're a last-minute packer, this app is a lifesaver. It will keep you organized and ensure you don't leave anything important behind with its 250+ pre-installed camping items. The app's strength is its level of personalization. You can add any item to any category — or even make your own category with supplies that fit your needs for any kind of trip. Assign lists to different trips you're taking, and you'll be super organized in a snap. 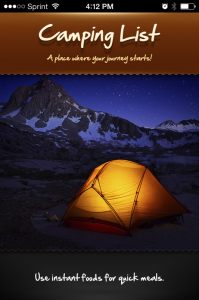 For Android users, Ardent Camper recommends Camping Trip Planner ($0.99), which includes similar features, as well as an export function so you can share your lists with your travel buddies. Your iPhone's light is impressively bright, and this app makes the most of it — plus it allows it to dim to whatever level you desire. Integrated with its own compass, the flashlight features a steady light and nine different strobes (including SOS), making this app a great backup to your Maglite in case of emergencies. The only thing it's missing is a red light to preserve your night vision, but there is a nifty mini map that shows your surroundings when you tap on the compass. Android users might enjoy Color Flashlight HD LED (free); I loved the color wheel for camping when I used it on my HTC EVO. This social network for outdoorsy types has just received recognition by the App Store, and in my opinion it's well-deserved. 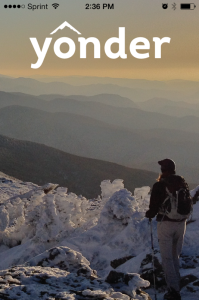 Yonder is an app for sharing inspiring photos, as well as finding activities and beautiful sights all around you. When you first make an account, you're invited to select the outdoor activities you love, and Yonder will tailor the content you see to what interests you. You can integrate your account with Facebook to spread the joy even more. Keep up with your friends' activities and make new connections by liking and commenting on photos. When you find something you want to try for yourself, add it to a custom list, and get in the action! This comprehensive app with more than 700 recipes categorizes food by whether or not it's suitable for backpacking, by prep time, and by category. You can also search all recipes and add those your family loves the most to your favorites list. You can also send recipes via email and connect to your friends through Facebook and Twitter. Perhaps most interestingly are the emergency survival foods to accompany the old standards like spaghetti and campfire stew: recipes like ant flambe and roasted grubs. I doubt those get used much, but it's good to know you can sate extreme hunger in gourmet style! A great alternative app for Android users is 100+ Camping Recipes Free. This simple app displays your altitude and GPS coordinates to make sure you stay oriented and that altitude changes don't sneak up on you when you're hiking. 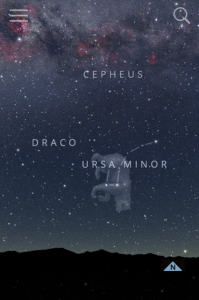 This beautiful app enables you to really delve deep into the night sky. Whether you're out camping and trying to determine which planet you're seeing or which constellation is above you — or whether you're in your light-polluted front yard and can't quite tell if the speck of light overhead is a satellite or a celestial body, hold your iPhone up, and Sky Guide will let you know. This app is richly filled with original constellation artwork and built-in articles that discuss their mythological origins. It must be seen to be truly appreciated, so don't hesitate to add this app to your collection. Sky Map isn't quite as slick as Sky Guide, but it's a great alternative for Android users — and it's free! This one's expensive, but it proves well worth it for those who love to explore their surroundings — both urban and backcountry. Geocaching is a treasure hunting activity that is fun for adults and children alike in which players are guided by GPS to find secret caches in different places — often beautiful, inspiring or interesting. Sign up as a member on Geocaching.com to learn more, bring some little tokens on your hike to place in the caches you find, and start searching! The app will help guide you to your quarry and allow you to mark your victory in your account. Camping and in a bind — or rather, you need to be in a bind? This simple app categorizes knots by type and name and allows you to create lists of favorites. 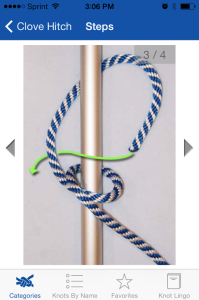 Once you select a knot you wish to learn, you'll be treated to full-size, step-by-step instructions. This app is military-focused but contains plenty of useful information about shelter, safety, and more. It's a pretty quick read, and the contents are well worth the time of any outdoor enthusiast. Any applications I've left off, or great tools that you've used on your own outdoor adventures? Tell me about them in the comments!